In 4-quart Dutch oven, place beef, pork hock, water, broth, salt and pepper. Heat to boiling; reduce heat. Cover; simmer 1 hour to 1 hour 30 minutes or until beef is tender. Shred beets, or cut into 1/4-inch strips. Remove pork hock from soup; let stand until cool enough to handle. Remove pork from bone; cut pork into bite-size pieces. 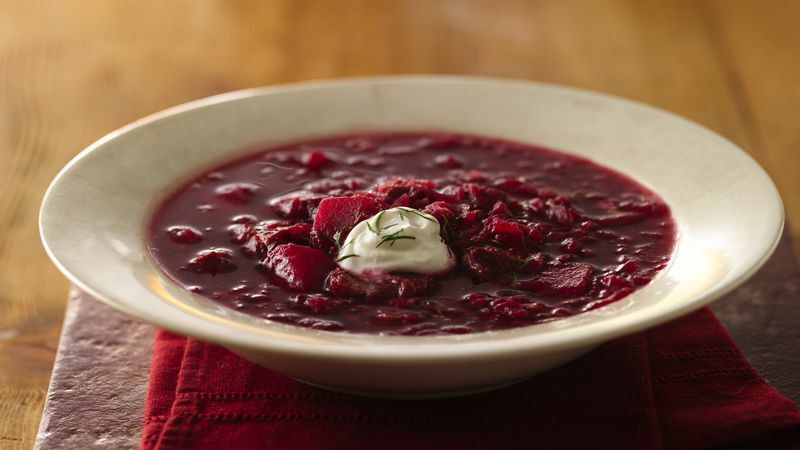 Stir pork, beets, cabbage, potatoes, onion and garlic into soup. Tie pickling spice and dill seed in cheesecloth bag or place in tea ball; add to soup. Cover; simmer 2 hours. Stir in vinegar. Simmer uncovered 10 minutes. Remove spice bag. Serve soup with sour cream. Sprinkle with fresh dill. Slow Cooker Directions: Decrease water to 3 cups. Shred beets, or cut into 1/4-inch strips. Spray 4- to 6-quart slow cooker with cooking spray. In slow cooker, mix all ingredients except vinegar, sour cream and fresh dill. Cover; cook on Low heat setting 8 to 10 hours. Remove pork hock and cut pork as directed in Step 2. Stir pork and vinegar into soup. Cover; cook on Low heat setting 10 minutes. Serve soup with sour cream. Sprinkle with fresh dill.